The kids find each other in the dark of the morning. I lift a sleep-startled ear towards the sounds of squeaky voices carrying on an exchange endemic to two small people who share everything from parents to underwear; for whom “personal space” constitutes stepping back one inch, so as to still get a good vantage while the other pukes into the toilet. (this is not fiction). “Coley, now I read you a book.” Rose announces and then parses out the first sentence, duly memorized, from our new favorite, Skippyjon Jones. “Okay Coley, you go get yer fwiends. Dan rolls over and is asleep again in an instant, but I am drawn into the early morning show of my two children, bending my ears to what passes as entertainment these days. Two years ago, when Col was 2 ½ and Rose was a koala on the eucalyptus tree of my body, everything was wrong. Col wanted to stay another ten hours at the train station, clutching sooty railroad spikes like old friends and dancing to the tune of ear-splitting train whistles. Rose wanted to get back home for a quiet nap, barnacled up against my skin. I felt like a circus juggler, trying to keep diapers and cheddar bunnies and flaming sticks of fire all in the air at once. When I have no patience for Rose, who’s camped out at the bottom of our stairs whining that she needs to be carried up, Col valiantly steps in: “I’ll help you up Rose.” And the two of them lumber up, slightly out of synch—clomp, lurch, clomp, lurch—hand in small hand. I can only hope they’ll seek each other out in the dark of the morning ten years from now, but I do hope by then they each have their own underwear. I’ve got some of that going on over here, as well! lovely. *almost* makes me regret not having a second child. just found your blog. it’s refreshing to find insightful, well written posts. i’m sure i’ll be back. What great pics of that sibling bond! I especially love the one where Cole is feeding Rose. Hawthorn has begun to be fascinated in feeding Lake too and it is too funny to see Lake do the dive toward the spoon of food held by someone not much older then them. So special. Ooooh, Mama. Those two make my clock tick! Oh, this makes me want another! I love this post! For one, you’re writing is so beautiful. Captivating. For two, just hours ago, I caught the first glimpse of Theo & Sully actually playing together and my heart became an instant wad of goo. The first time I ever had that same feeling…how amazing that they have each other, and will grow up together as brothers and most importantly (hopefully) friends. from the crazy juggling of the early years (i think our kids are about the same age difference ~ mine are 22 mos) to the fights that melt into silly play. we recently pushed our kids’ mattresses together (in hopes of keeping them both in their bed and not in ours) and they now sleep all curled up like two little kittens. it just melts me to see how much they love each other. It makes me remember the joy of youth with my own siblings! There really is nothing like a ready-made best friend!! And, by the way, if my younger sister is any kind of standard, don’t get your hopes up on the whole underwear issue. She ran out while visiting me a few weeks ago, and we had to make a quick trip to get her some more. Cause, dude, it just wasn’t happenin’ like it did when we were kids. What’s mine is mine if I wear it on muh booty. By the way, that comment above was me, Cam, not Rubi Slippers, that’s a WP I’m working on for a friend of mine…Sorry ’bout that! These are precious moments. Come on over, we are doing a giveaway you might like…! I love the way you write. My children now are in their 30s with kids of there own. This post brought back so many fabulous early morning memories. Thanks so much. So sweet! I adore the picture of Col reading to Rose. 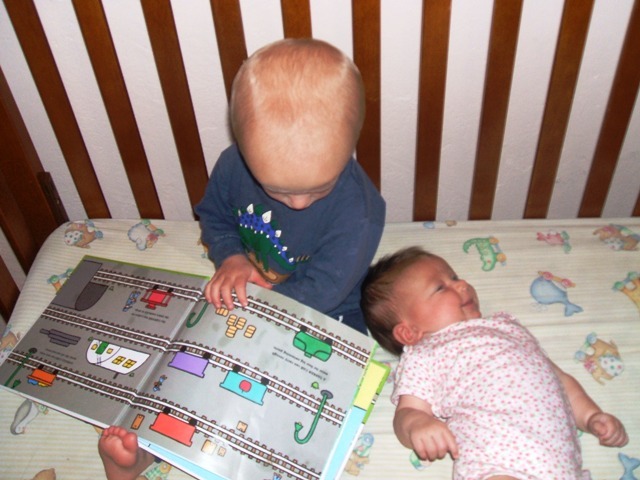 That was me as a two year old reading to my newborn sister in her crib. My mom searched the house all over for me, only to find that I had climbed in to read to my new little sister. That boy obviously knows that books mean love. And then, the last picture of the two of them baby-wearing. Priceless. So lovely. In the moment, I was less-than-happy-enough to have my first two 20 months apart. Within months, though, I was thrilled. Glad these two have each other. Ahh, sibling love. Truly, how special it is to watch that relationship grow. I love the koala reference, and love that your two are about the same age apart as my two olderst gals. I like what you have to say and thanks for your baby-by-the-sea comment not so long ago. I stumbled upon you through MamaMayIWrites & DigThisChick, as I’m an old pal of those two talented ladies. they are soooo f-ing cute! This is so sweet. I love to step back and watch Mae and Otto be brother and sister. I really appreciate the way you capture it. The love for your little ones always puts a big smile on this girls face. Thanks for sharing your thoughts with us. Always a pleasure to read your words friend. I taggged you in a post I am writing for tomorrow. You can play along if you want..or not. It is sharing 10 simple things that make you happy and then picking ten people to pass it along to. You are one I picked. I’m glad I found your blog. It’s inspiring to see the poetry in your prose. I love writing and have found my blog to be an outlet of sorts, although my newer posts have been rather short due to the sheer lack of time. You’ve inspired me to stay true to my own form. It’s so nice when they start playing together. It takes a lot of pressure off me. My daughter will take Eli to the bathroom. Solomon helps Eli with legos. My kids are so close, I hope they remember when they’re older!